In his annual letter to investors, Warren Buffett made a somewhat shocking disclosure. His company, Berkshire Hathaway, now has a cash-on-hand balance of more than $116 billion. That massive pile of cash exists because Mr. Buffett makes decisions that end up producing stable, consistent returns. Each year, Berkshire releases an annual letter, and investors take his insights to heart because of their respect for his success. He isn’t buying stocks (or companies). Why? Because he believes that they are grossly overvalued. This “buy wrong and sell-if-you-can” philosophy Buffett alluded to when he described the “optimistic purchasers” should be a big warning signal for you. You see, Warren Buffett sees stocks as a way to gain ownership in businesses. He doesn’t see them as “ticker symbols”. Then, he helps a business get more successful by making sure management is successful. 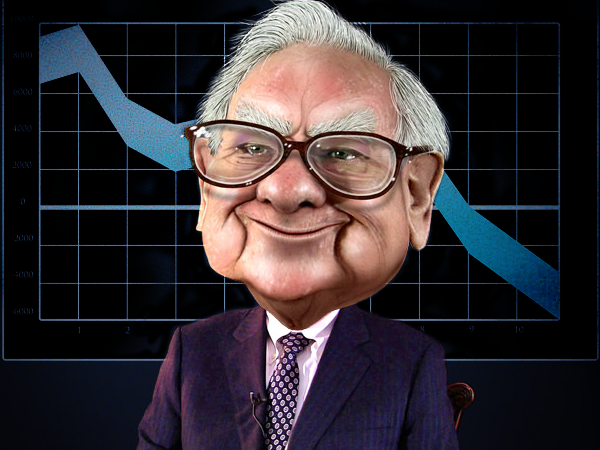 When a business is successful, Berkshire makes more money… and so does Buffett. Afterwards, he usually buys more ownership share in more businesses. If there is one investing signal that you should pay attention to, it’s when one of the most successful investors in history isn’t investing in assets. And for the foreseeable future, Buffett has stated Berkshire Hathaway won’t be buying. In fact, he’s directing them to hold back a ton of cash — $116 billion worth of liquid cash, to be exact. And that’s a 35% increase in the cash position over the previous year. He’s preparing for the market to correct in a big way. After all, there are more warning signs that it will correct big-time in 2018 than any other year in the last decade. Buffett is aware of all of this. So when the market does correct, he knows the typical investor will get scared and start selling off shares as fast as possible. He will wait that out, and when the time is right, he will most likely direct Berkshire to carefully start buying stock shares in businesses at wholesale prices. And with $116 billion, he’ll be able to scoop them up quickly, easily, effortlessly. Then if all goes to plan, when those businesses go back on the upswing, he will likely put more “cash in the till” in one day than most businesses see in a year. But don’t get him wrong. Warren Buffett would be the first to tell you that even he can’t predict everything correctly. Berkshire Hathaway has lost money too, and lots of it. So even the best investors can get it wrong. But Buffett-billions cure a lot of ills. The key difference between Buffett and most investors is Buffett can afford to lose billions and still come out on top in a short period of time. … but you probably can’t. For those who don’t have billions like Buffet, it’s best to make a strategic play to protect your financial assets. As Warren Buffett has said, “Be fearful when others are greedy and greedy when others are fearful.” Let other people think the market is invincible while you prepare yourself instead. Buffett’s main investment strategy is built around business ownership. But with greed so rampant in the stock market today, his own maxim would dictate that now is a good time to trade stocks for something more secure, such as precious metals like gold. Inflation Is Here, Stock Market Back To Normal?